Social opportunities for seniors take on greater importance when they are retired or live alone. Group activities are an excellent way to put your aging loved one in contact with multiple people at once who can serve as his or her extended support network, and you can use the following ideas as inspiration for planning a fun senior gathering. Today’s seniors want more out of life than to sit in their favorite chair whiling away their time, and you can use technology to engage your loved one’s fun side. With today’s interactive video games, you can plan a competition that gets your loved one and all of his or her friends moving. From playing virtual golf to carnival games, everyone will be excited to take part in a group gaming competition that keeps them active. Many older adults need help adjusting to new technology, and they also require assistance managing their daily tasks. There are many reasons seniors might need assistance at home. Some may require regular mental stimulation due to an Alzheimer’s diagnosis, while others might only need part-time assistance with exercise and basic household tasks. Home Care Assistance is a leading Rhode Island senior care provider. Families rely on our expertly trained caregivers to help their senior loved ones maintain a high quality of life. Years ago, entire communities would get together for barn raising parties when someone hit a downfall. While your loved one’s neighbors likely no longer need help building a barn, every community has people in need who benefit when seniors get together. Help your loved one identify a need that he or she would like to fill in the community. For example, your loved one may want to knit hats for newborns or build miniature library boxes to put outside the houses in the neighborhood. Once your loved one has a plan, initiate a regular meetup for like-minded seniors where they can all work on their community service projects together. Seniors may require transportation to participate in community service projects, and family caregivers aren’t always available to provide the assistance their loved ones need. Whether your elderly loved one needs part-time assistance with basic household chores or you need a break from your caregiving duties, the Rhode Island respite care experts at Home Care Assistance are here to help. All of our respite care services are backed with a 100% satisfaction guarantee, there are no hidden fees in our contracts, and we never ask our clients to sign long-term contracts. Older adults still love getting out and mingling. However, going on a pub crawl may be out of the question for seniors who are watching their health and don’t want to be out late. Fortunately, you can give your loved one that same sense of adventure by planning a senior house crawl that allows him or her to spend the whole day with friends. Simply have each member of the group plan to serve a dish or host a short activity at their house. Then, arrange for someone to drive the group to each house where they can have fun in different environments. Shy seniors may not be up for an adventurous group outing, and book clubs are perfect for giving them something to talk about with new friends. Check your loved one’s local library to find out if they already have an established book club, or you can start one of your own. Your loved one will enjoy preparing for the meeting throughout the week, and talking about the books will stimulate his or her thinking skills. Seniors with pets benefit from having a constant source of companionship, and you can take this to a whole new level by helping your loved one plan a weekly pet party. Simply have your loved one send out invitations to friends with instructions to bring their pets to the party. Then, plan pet-friendly activities such as an obstacle course for dogs. Music holds valuable benefits for seniors, as the rhythm can help them relax and face life’s challenges. Whether your loved one enjoys playing the harmonica or an electric guitar, it’s never too late to start a band. Encourage your loved one to reach out to his or her friends and invite them over for a jam session. Once they’ve gotten some practice, record their playing and send the videos to family and friends. 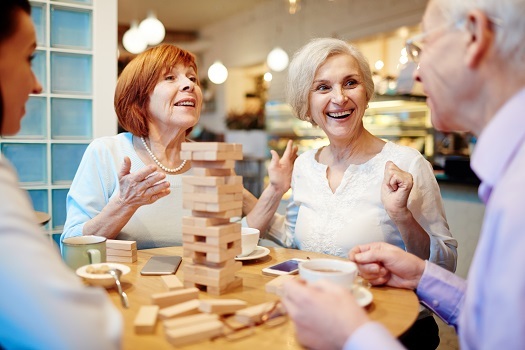 Engaging in group activities can be beneficial for seniors in a variety of ways, but they may also need assistance managing certain age-related conditions. If your senior loved one needs help managing an illness or assistance with daily tasks, make sure you choose a top-rated provider of home care. Rhode Island Home Care Assistance is here to help your loved one live a happier and healthier life in the golden years. From the mentally stimulating activities in our Cognitive Therapeutics Method to our friendly Care Managers who are available to answer your questions 24 hours a day, we offer a wide array of high-quality at-home care services. Call (401) 284-0979 today to learn more about our premier in-home care plans.